It's sad, isn't it? A perfectly good movie ruined by a perfectly awful sequel. Same old story, no? That's really almost all I can say about "Analyze That". I'm getting tired of these kind of rip-off films, and not only because of the obvious. It's actually a chore to write any sort of review for them. This could be any franchise comedy sequel "Rush Hour 2", "Men in Black 2", etc. My words concerning this movie could almost be interchangeable with what I would say about many other sequels. I'll think of something to say while you read the plot synopsis below. Here's the deal: mobster Paul Vitti (Robert DeNiro) was caught for his mafia crimes in the first film of this franchise, "Analyze This". In jail, he becomes both a popular and feared figure; no one will even dare challenge him when he changes the channel on the prison TV. Soon, there are a few attempted tries at Vitti's life, and he realizes he needs to get out. So, he knows just what he needs to do: pretend to go completely batty. After singing one too many "West Side Story" tunes, Vitti is transferred to an institution for the criminally insane. 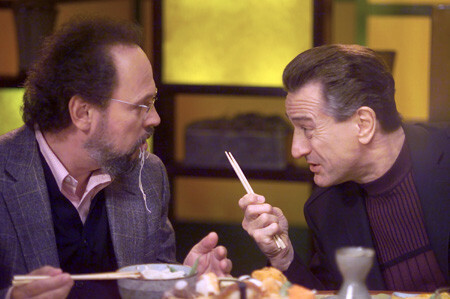 Old friend and shrink Dr. Ben Sobol (Billy Crystal) is called in to look over Vitti's case. Once Sobol decides that he thinks Vitti isn't faking, Vitti is inexplicably trusted into Sobol's custody (much to the chagrin of Sobol and his wife Laura (Lisa Kudrow)). Sobol is furious when he finds out that Vitti was faking all along, but Vitti has more important things on his mind: he needs to find out just who it is that's trying to kill him. Wow. Would you know it, I still haven't thought of anything to say. It's pretty pathetic that "Analyze That" can't even inspire one write something bad about it. I cannot even passionately loathe it like a "Pearl Harbor" or a "Death to Smoochy". If I think of "Analyze That", I'm left with nothing. It's just an incredibly mediocre film. I'm very tempted to stop the review right here and just write "meh" in huge lettering. But I resist. One thing I can tell you is that "Analyze That", unlike something like "Men in Black 2", is not an exact copy of the original. Don't let that make you think that it has anything fresh or funny in it. What it does is take one possibility that could have arisen from the situations in "Analyze That" and turns it into one long, one-and-a-half hour bad joke. "Analyze That" is a copy of a thousand gangster stereotypes, but it seems that the filmmakers behind this mess didn't want to re-use their own stuff. Nah, they just stole everyone else. Usually, I don't think anyone really deserves to lose money on a film, because most of the time, a lot of hard work goes into it. Even if the film is terrible. But didja ever hear the one about the movie that deserved to flop as badly as it could? Hmm? Yeah. I didn't think it was that funny either. "Analyze That" is rated R for language and some sexual content.